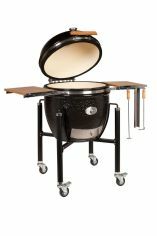 I've reviewed as many kamado grills as possible including the Big Green Egg smoker. All kamado grills are not the same and you can save a lot of money by getting the right one to suit your needs. Above left we have a Big Green Egg smoker and to the right a Primo XL Oval. Great for all year round cooking - My own ceramic grill is a Monolith (indeed it's the Monolith Classic that makes it to the top of my best BBQ smokers 2018 charcoal section) and I use it come rain or shine because the results are simply divine. Ceramic is a fantastic insulant and this give the kamado significant advantages over other types of grill and smoker. Moisture retention - the totally enclosed style of cooking means that the natural juices in your food are preserved within the shell of the kamado. Food comes out succulent and juicy. Ambient temperature is more or less irrelevant. When using a steel smoker the outside temperature can make a big difference in terms of how often you stoke a fire and how difficult it is to maintain a stable temperature. You don't get these problems with a kamado and you can cook on a kamado all year round. Good heat retention also makes them economical to run. A ceramic kamado will consume only a third of what you might expect of a traditional charcoal grill. Temperature range - you can smoke at low temperatures yet at the other extreme you really can use them just like a high temperature oven. They are heavy - not an issue if you plan to keep your kamado smoker in one place but even in a cradle, moving one of these units is a two man job because if the unit falls over it's going to crack and then it is useless. They are expensive - another good reason not to break it! I've written a lot about the Egg and the Primo, more so than other kamado grills quite simply because I've had the opportunity to cook with them a lot... until I got my Monolith. The Green Egg smoker probably still leads the way in marketing and Primo is popular too but read on, there are some good (better value) alternatives too! There’s been a lot of debatable stories written about the origins of the kamado and who brought it to America and to be honest I don’t know what to believe so the history below is generic so you can believe what you read. Humans have used clay vessels to cook their food for thousands of years. Archaeologists have found clay cooking pots in every part of the world, and some of the earliest found in China have been dated at over 3000 years old. It is believed that in these circular clay cooking vessels, the origins of the Kamado are to be found with the clay eventually being superceded by ceramic materials. The basic cooking vessel has evolved in different parts of the world and in Japan an interesting device developed that cook rice in a unique manner. The Mushikamado steamed rice was used by families for special ceremonial occasions. The Mushikamado was made of clay and found in Southern Japan, it consisted of a round and domed base with a similar shaped lid that lifted off the base. Innovations from the basic clay vessel included a damper and a draft door and this later version was fuelled by charcoal. A rice pot with a wooden lid would be suspended over the firebox and allowed to steam inside the Mushikamado. In the early 1970’s companies in the U.S. started to manufacture ceramic Kamados. These modern Kamados were made of high fire ceramics and had a high gloss ceramic glaze similar to that used by Corning Ware. The modern Kamado corrected two major problems with its Japanese predecessor. Rather than being painted, it was glazed. From here it has been subject to continuous improvement to make it one of the most controllable and forgiving outdoor cooking techniques for the barbecue enthusiast. Whilst Charcoal is still the most popular and traditional fuel for heating, there are some examples of electric and gas fired versions. 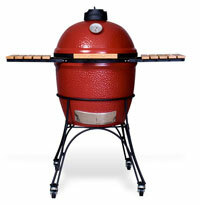 The most respected Kamado brands are Monolith, Primo kamado, Big Green Egg® and Kamado Joe. 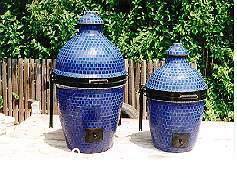 With the pressure for low cost manufacture only the Primo is still made in the USA and 2 of the others (Monolith and Kamado Joe) are now back in China in their ceramic barbecue origins. The Green Egg smoker is made in Mexico. Don't use lighter fluid to get your kamado going. Ceramic is porous and the lighter fluid will get under the skin of your kamado. The purists will say use an electric lighter but I find that a charcoal chimney burner is cheap and perfectly acceptable as is a non petroleum based firelighter cube. Use lumpwood charcoal in a kamado because lumpwood produces about a third of the ash compared to briquettes. Critical to the temperature control of a kamado smoker is the air flow from the bottom damper upwards, if that flow is blocked by excess ash your fire will die. Note: A good balance of heat intensity and airflow is created by a mix of large and small chunks. The branded charcoal marketed by Monolith, Kamado Joe and Big Green Egg is more expensive than other brands but I think that it is worth it. Moreover these brands are made from virgin hardwoods unlike some who manufacture from old furniture. To get your fire going, pour in some charcoal, add a lighter cube, light it, close the lid and open both top and bottom vents fully. You'll see the temperature quickly rise to about 150°C (300°F) and this is the effect of the lighter cube. As the cube extinguishes and the lighted charcoal starts to take hold you'll notice the temperature drop to about 100°C (212°F) for about 2 minutes and then start to clime dramatically. It's at this point that you need to keep your eye on things. If you overshoot your desired temperature you will find it difficult to cool a kamado quickly. Get it close to the temperature you want, add your food, close the lid and then spend a little time adjusting the dampers to get to the desired temperature. Doing it this way will save you time in the long run and guarantee perfect results. At the end of the cookout or when you want to open the lid to turn the food remember to "Burp your Egg"... this is terminology coined by the Green Egg smoker guys but it applies to all kamados and is a very serious point. Put simply, when you have been cooking with the lid down and want to open, lift the lid gently to give about a one inch aperture for about 5 seconds, then you can open the lid fully. The science is that when you open the lid quickly and fully (especially when grilling at high temperatures) the sudden rush of oxygen can cause a flash point...at best you could lose your eyebrows but it could be a lot worse. Don't cool your kamado by throwing water in it...it will crack the ceramic and your kamado is useless. Take time to play with the dampers and understand how each setting alters the temperature. I've documented my experiences here. Clean a kamado by giving it a high temperature burnout. Open the bottom damper fully, remove the top damper and leave the chimney open, 30 minutes at 400°F or 200°C will burn off all remaining food debris. You can the scrape the sides with a steel brush but never use soap and water because the water will be absorbed into the ceramic. Kamado cooking is all year round but if you live in an area (like I do) where we get damp cold then your felt gasket can get wet and freeze so sticking the lid to the body. Prevent this by placing a sheet of polythene / plastic between the lid and the body whilst your kamado is not in use (and when it has cooled down!). If your gasket does freeze use this technique to quickly solve the problem. Check what you are getting when you make a price comparison. 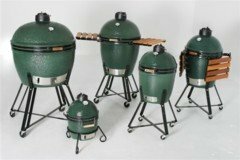 When you buy a Big Green Egg smoker, the base price usually includes just that and nothing else. The same goes for Primo but other brands (such as Kamado Joe and Monolith) will include the stand, side tables and sometimes a few other extras. This is important, it will ensure that you get the right deal and safeguard you from buying something and then finding you've still got to fork out hundreds in extras. Most kamado brands have the heat deflector stone or "plate setter" as an option. This shouldn't be an option, it should be a must. If you're going to spend your hard earned cash on a new barbecue and a kamado grill is your chosen purchase, if you miss out on the heat deflector stone you'll only get half the experience, half the fun and half the value out of your investment. For the same reason the pizza stone should be thrown in too. Look out also for brands that have the heat deflector stone in two halves - Primo XL Oval, Monolith and Kamado Joe. This type of stone allows you to cook directly and indirectly at the same time and when it comes to cooking burgers and steaks I think this takes kamado cooking to a different level. The next page link will take you through to interesting articles on the BBQGuys.com website and I've included them because they do make good points and comparisons. 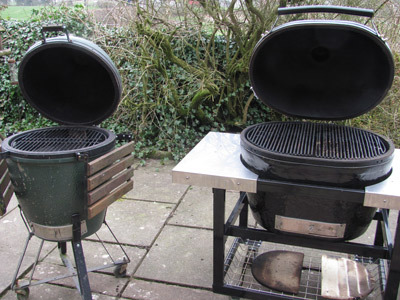 BBQGuys.com is an online store, if you choose to buy through them then I take a small commission, it makes no difference to the price you pay but it does contribute to the running of this website and for that I thank you heartily. 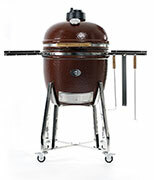 Click on the links below to read our individual reviews of each kamado grill. More and more of these grills are coming to the market every day as the Chinese get hold of them and do what they are good at - copying a design and applying their low cost labor rates. Ultimately whether these newer entrants to the market stand the test of time (and quality) remains to be seen. In the meantime, it's the Big Green Egg smoker, Primo Kamado and those others listed above that take care of the majority of the market.